This essay was originally published as "The Specters of 1917" in The Towner. Willi Münzenberg, the interwar head of the Comintern’s Western propaganda apparatus, hated going to Moscow. He usually ended up staying with the other German and foreign communists from the apparat at Hotel Lux, which his civil partner Babette Gross, described as a place of “constant intrigue where everyone spied on everyone else.” In the mid-thirties, Hotel Lux became an oubliette that devoured foreign communists. The Old Bolshevik, Karl Radek, was arrested in 1936, shortly before the official adoption of the new Soviet Constitution he helped write. Nikolai Bukharin, who had once been the party’s leading theorist, allegedly turned white as a sheet when he received the call to return “home” while in Paris. Some comrades begged him not to go back. He went anyway, and was broken at theTrial of the Twenty-One and purged. On their last trip to Moscow in ‘36, Münzenberg and Gross found the former KPD leader Heinz Neumann living a spectral, pariah existence as a translator at the hotel; he embraced them both and cried, knowing that it would be the last time he would see them (he was purged in ’38). Münzenberg and Gross spent a long night awake, waiting for a knock on their door from the NKVD. The next morning, Münzenberg made a big scene to retrieve their passports and exit visas, and they fled back to Western Europe. In 1940, after trying to flee France on foot in the company of a mysterious “red-headed youth” who nobody knew, Münzenberg was found hanging in the forest near the French-Swiss border. His death remains a mystery, painfully unresolved in Gross’s excellent biography of her late husband. 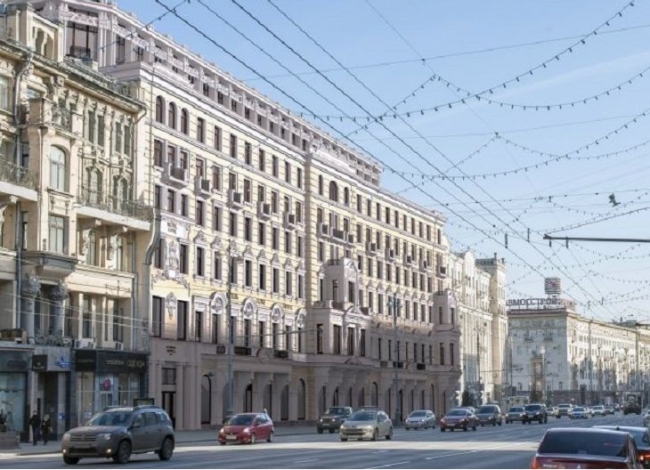 The former Hotel Lux in Moscow, filled with so many ghosts of murdered foreign communists, remains shuttered today, hidden behind a canvas construction facade on Tverskaya. After we parted, I made my way to the Gorky museum. When he decided to return to the Soviet Union under Stalin’s tutelage in 1931, Gorky was housed in an expropriated art-deco mansion belonging to a former industrialist family. Gorky had never owned property. He worried that upon his return he would be placed in a huge manor that would make a “justifiably negative impression on people working like hell, eating in cattle sheds.” The Ryabushinsky Mansion served as his home, and the de facto headquarters of the Soviet Writers Union, for the last five years of his life. I paid my 100 rubles and the security guard instructed me to put on little hospital booties over my shoes before entering the house. Motes of dust swirled in front of the swirling art-nouveau windows, and the grand marble staircase looked like it was sculpted in cake frosting. All of Gorky’s books lay untouched, as was the big wooden table in the living room where the writers would meet and pound out socialist realism. The house had good energy, it felt comfortable, one could imagine living there among the ghosts of the future lost in the past. On the third floor, there was a little exhibit to the Ryabushinsky family, with some religious people selling icons and Orthodox paraphernalia in their former “prayer room,” which had been shuttered after the revolution.